The Spring issue of Twist Collective went live on Friday and I am incredibly excited to say that a pattern of mine is included amongst the other fantastic designs. 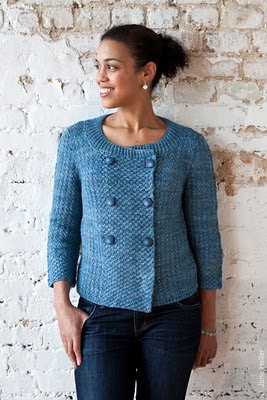 Blue Daisy is a textured jacket worked in two different stitch patterns in one piece from the bottom up, with set-in sleeves worked in one piece as well. The shape makes for a pretty wearable piece and the complementary stitch patterns give it a little somethin' extra (at least that's what I was going for!). It seems like a lifetime ago that I found out this design was accepted and I started working on it (Daniel was something like the size of a large peach and the Giants were just entering the postseason), but I definitely remember the yarn (Briar Rose Celebration) being a dream to work with. You can get your very own copy of Blue Daisy here and if it's not your cup of tea, I hope you find something else in Twist that you might want to knit! It's a real stunner of an issue, if you ask me. This is one of the patterns that caught my eye :) I love the short-row collar, and how the stitches play against each other. Congratulations! It's really beautiful! Exactly the type of yarn that draws my attention! This is a beautiful jacket! Very classic! Just gorgeous! I love the texture, plus what a gorgeous shade of blue. Briar Rose yarn is always fabulous. It's a gorgeous pattern, congratulations!!! You design such lovely knits. Congrats, your design is cute and classic! Such a great classic piece! You're so awesome! I hope you are getting some sleep!! Pretty! I love the sleeve length and the texture and it is oh so Coco. I will live to a ripe old age just trying to keep up with your designs. I love this and am making it! I just hope I can do it justice as I'm quite new to knitting. I'm feeling the fear (joining sleeves)and doing it anyway... Your other designs are fab too. Congratulations on the birth of your gorgeous boy - what a little treasure. I just purchased this design from Twist Collective. I can't wait to get started on it. congratulations hilary on another gorgeous pattern!